From Goodreads: Can an Immortyl society survive in a modern world? From the ashes of the first battle of the Immortyl Revolution, vampires Mia Disantini and Kurt Eisen set out to build a new Immortyl society. Trouble arrives in the person of Cedric MacKinnon, a runaway adept of the ancient arts, who brings tidings of upheaval at the chief elder’s court that threatens everything Mia and Kurt have accomplished. Mia finds it hard to resist when Cedric pledges his service and tempts her with the legendary skills he learned as an Immortyl courtesan. Facing opposition from both within and out, Mia begins to doubt Kurt is up to the task of leading their followers to his vision of an Immortyl Utopia. 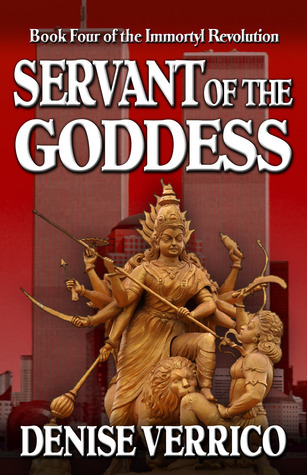 Torn between her loyalty to Kurt and Cedric’s insistence that she is the earthly manifestation of the Goddess Durga and destined to lead, Mia confronts the greatest challenge of her life. Denise is a New Jersey native who grew up in Western Pennsylvania. She attended Point Park College and majored in Theatre Arts. For seven seasons, she was a member of the Oberon Theatre Ensemble in NYC. Denise has loved vampire stories since she was a little girl and a fan of Dark Shadows. She currently lives in Ohio with her husband and son and her flock of seven parrots. Please enjoy this excerpt from this great book! Sounds great, doesn’t it?? From what I’ve gotten to read of this series, this book is well worth reading. The writing is done very well. If you’d like to check out more about this series, visit the website here. 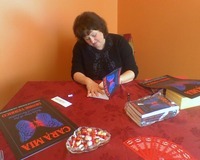 You can find the author, Denise Verrico, on facebook, twitter and goodreads. You can get the first three books in the series here.